Increased strength, versatility and specialisation are just some of the attributes of the latest developments in rope technology. Rope manufacturers continue to steadily improve the quality of the synthetic fibres most widely used on yachts: double-braid polyester, Spectra, Dyneema, Vectran and PBO. The most dramatic recent improvements, however, have been in developing specialist covers over the cores of these widely accepted synthetic materials to suit varying applications on a yacht. This was accelerated by the campaigning towards the 2007 America?s Cup, which hopefully is not going to be the last. The loads on sheets, braces and runner tails on the bigger boats are so high that when they are being surged off a winch drum they generate enough heat to melt standard polyester covers. Kevlar, PBO, Technora, Cordura and Nomex are used in varying combinations and plait configurations for improved heat and abrasion resistance to suit particular applications and yacht sizes. ?For some applications, we are trying to get some grip on the winch, in others we are trying to make it slippery like a spinnaker sheet where we want it to ease quite quickly,? says Bruce Clark, of Sydney Rigging. Double-braid polyester, which has a braided core of polyester as well as the polyester braided cover, is suitable for spinnaker halyards, topping lifts and headsail sheets on medium performance smaller boats where stretch is not a consideration. Spectra is the trade name for a polyethylene fibre derived from crude oil developed in the US by Honeywell in the 1980s. It has one of the highest strength-to-weight ratios of any man-made fibre, is light enough to float and has superior resistance to chemicals, water and ultra-violet light. Honeywell says that its top grade, Spectra 1000, is 15 times stronger than steel. Dyneema, a similar high molecular weight polyethylene from Dutch State Mines (DSM), has a higher breaking strength in larger diameters and slightly better wear characteristics in heavy use areas. Its newest fibre, Dyneema SK78, is stronger and has lower 'creep' (stretching permanently when placed under constant load) than its previous bench mark Dyneema SK75. Vectran, developed in Japan, is a liquid crystal polymer. Its molecules are stiff, rod-like structures which give it excellent fibre tensile properties. It has very low stretch, a high-breaking strength and negligible creep. It is good around tight bends and has good abrasion resistance. PBO is a fibre that came from a class of high-performance polymers called PBZs. It is stronger than steel, has extremely low stretch and no creep. It was used in halyards and standard rigging on the America?s Cup yachts and is finding favour in grand prix offshore racers. Downsides are it does not have good flex resistance, degrades quickly in sunlight and is extremely expensive. Dynex and the newer-generation Dynex Dux are extremely strong ropes produced by Hampidjan of Iceland from DSM Dyneema fibre. They are stronger than steel wire ropes of the same diameter, will float, have low elongation and are extremely flexible. Dynex Dux 75 is a pre-stretched braided rope with ultra-high breaking strength. It is very firm and compact with a smooth surface. Elongation is very low, about three per cent. The rope is impregnated to improve abrasion resistance and endurance. Besides the aramid Kevlar, Nomex and PBO, Technora and Cordura are now being used in jackets on high-performance boats. Technora, a para-aramid fibre made from co-polymers, has excellent fatigue resistance to avoid abrasion around winches and better heat resistance then Kevlar and is salt-water resistant. Cordura, a nylon fabric, has high abrasion resistance and general toughness. So which rope would you use where? 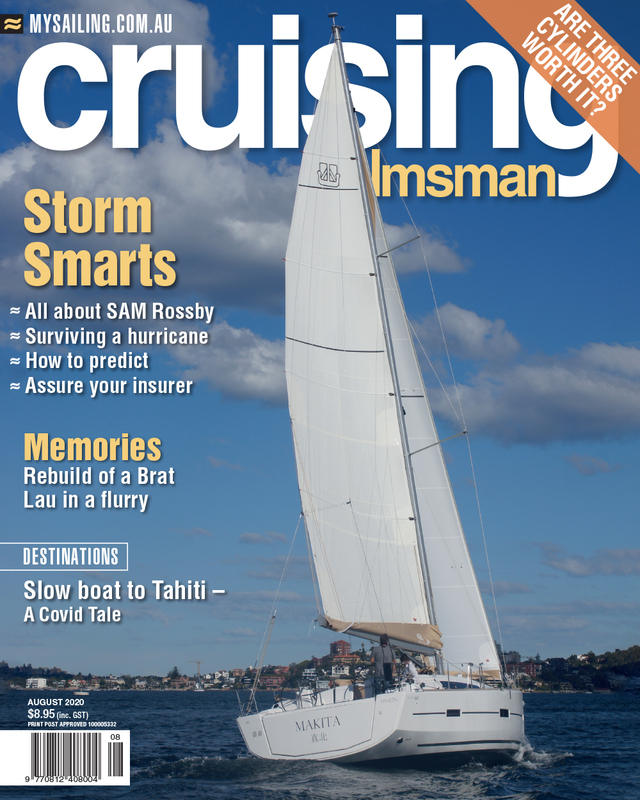 Australasian Yachting asked two experts for their advice: Phil Bate, of Riggtech, who looks towards the grand prix sector, and Alan Carwardine, of Allyacht Spars, for advice on running rigging for cruiser/racers and cruising yachts. Some classes, like the Farr 40s and Sydney 38s have running rigging specifications written into the class rules. But with the Farr 40s you can use some PBO in halyards. Where we could on high performance boats we would use PBO on the main and genoa halyards. Some of the boats use a change halyard in PBO, which could also be used for a spinnaker halyard, so we build a low-stretch halyard accordingly, with a Spectra chafe guard, so it can handle the chafe in the spectacle. The other spinnaker halyard would be Dyneema. While some companies are putting a Spectra tip on a Vectran or PBO halyard, we favour taking the low stretch material right to the clip, rather than having a piece of Spectra two metres long, which creeps and covering it with a Spectra chafe guard where it goes over the sheave. The chafe guard can be changed quite easily so the cored halyard will last for quite some time. We favour a proper eye-splice to the clip rather than the more convenient cow hitch. This folding hitch to attach the snap shackle to the halyard does make it easier to replace the shackle, but the hitch bites on itself, deteriorates and tends to break more readily than the splice. A way to keep costs down is only have the high-strength section of the halyard where it is needed when fully hoisted and splice onto it a sacrificial tail. For headsail sheets, it depends on what the boat?s doing. Most of the guys on the Farr 40s and Sydney 38s, for the constant wear of regatta racing, will be using low-wear Dyneema jacketed in Kevlar, Cordura, or that type of product. Long-distance offshore and coastal racers could just use unjacketed Dyneema sheets. For spinnaker braces, if the customer is prepared to accept the extra expense, we tend to use low-stretch Vectran, tapered and with a chafe guard near the clip to handle wear through the pole end. We also paint the chafe guards in Rope Cote, which is a product we have developed to treat them. It stiffens and stabilises the fibres in Spectra and Vectran cordage, holding all the fibres together and preventing unnecessary wear. Dyneema is the lower cost choice for braces and we always recommend Dyneema for spinnaker sheets, because it has no stretch issue and a longer life. The sheets are always tapered, which means less weight on the clew to let the spinnaker fly higher. For control lines and tackle systems like car pullers and barber haulers we are using Southern Lights, a new product from Donaghy's Southern Ocean, which is a blend of polypropylene and Spectra. It's quite strong but because it is a single braid instead of a double braid, it doesn?t tend to tangle or twist. Spectras or Dyneemas are the choice for the mainsheet on a race boat; for cruising boats, just double braids. For cruising boats, if the customer can afford it, I try to encourage the use of low-stretch Vectran on main and genoa because Dyneema and Spectra will drop the sails down because of creep. For high-chafe applications, say on the jib halyard where you have a deflector on the mast for the furler, we would have a Spectra halyard to handle the chafe around the deflector on a long-term basis. For sheets and braces, we would just use Spectra and, for spinnaker halyards, usually led through a hanging block, polyester double braid to keep the cost down. A good way to protect halyards from ultra-violet light is to attach a light line to the clip or shackle and pull them to the halyard sheave and store the tail under cover in the cockpit. Maintenance, otherwise, is just washing all lines in fresh water from time to time. The realistic life of sheets and halyards on a race boat is five years if they are looked after. You will probably get up to seven years on a cruising boat. Until recently, most yachts were using either polyester double braid, Spectra (or Dyneema) for all their running rigging, sheets and braces and anything else you can think of. These two products are still the main ones used today, but there have been many advances in rope technology in the past few years and no doubt there are many more to come. The words double braid are used in Australia for our standard polyester lines but they really describe a braided cover over a braided core which is the same construction method used in the Dyneema lines. Polyester double braid is used for sheet lines, control lines and spinnaker halyards on most cruising or cruiser-racers as the line is low in cost and is easy on the hands. The down side, which is not a problem in these applications, is the high stretch. Dyneema K75 fibre core with a polyester outer braid is the choice for most non-stretch applications, including main and genoa halyards and spinnaker braces. This line also has great wear, resistance and fatigue characteristics. Dyneema is easily spliced to maintain the outer-braid protection right to the shackle but can also have the outer case stripped back leaving only the inner Dyneema core for the last metre or two. This is common practice on modern race yachts to also reduce weight and windage while losing little strength. Originally this idea was sometimes frowned upon, with the worry of slow deterioration from UV, but this has proven to be reasonably negligible. Other fibres such as Dynex, Dynex Dux, Vectran and PBO are gaining more market share as their benefits are becoming accepted. Dynex is a single-braid modified Dyneema line that has much greater load-carrying capability and less stretch than Dyneema. It is coated with a UV polymer. Because it has no outer braid, the line cannot be clutched but it is excellent for runners or backstays and can be spliced very easily. Dynex Dux has even greater break load with less stretch than Dynex. Vectran fibre has similar break loads to Dyneema, very low stretch and low weight. But it does not like UV and must be treated or supplied with an outer braid. PBO is at the top of the list for break load and non-stretch with staggering specs. Although it also does not like UV, it does have great heat resistance and is therefore also used as an additive fibre into an outer braid for big race yachts where large amounts of line are run off a winch drum, generating enough heat to melt the line to the drum. PBO is also the choice for racing halyards with the drawback being its high cost. Yacht line has advanced so much that the clutch and cleat companies are struggling to keep up. The load-carrying ability is not just greater but, due to the low stretch, the shock loads have also become greater. This has also increased with the use of non-stretch sailcloth and carbon masts. It is always a good idea on cruising boats to horn-cleat your halyard, release the clutch and re-clutch. This allows the load to move directly on to the horn cleat, making the line last almost forever as even the best clutch will damage the outer braid eventually. The time needed to do this is not acceptable on a race yacht and the word 'horn cleat' on such a boat is a dirty word. A common prevention for rope clutch damage is to have your sailmaker stitch through the line around the area of the clutching. This stops the inner core slipping through the outer core, which is the big reason for the rope damage as the Dyneema inner core holds most of the strength and when slippage occurs the weaker polyester outer braid takes up the load causing outer-braid failure. Rope manufacturers will braid using their own preferred pitch on their braids. When the outer braid has a long pitch the rope becomes soft on the hands, easy to splice but will not wear or clutch that well. When a shorter pitch is used, the rope becomes rounder and harder with good wear qualities. The downside is that it is difficult to splice. Marlow's new D2 Competition 75 is designed to bridge the gap between traditional polyester ropes like its Marlowbraid (which has a low-twist three-strand core to reduce extension under working loads) and its D2 Racing 75. Using Dyneema SK75 cores, competition 75 incorporates a polyester inner braid and a new hard-wearing 16-plait polyester cover for increased strength and reduced extension at working loads. It is easily spliced and suitable for mainsail and genoa halyards and sheets, spinnaker and asymmetric sail halyards and sheets, spinnaker braces, main outhaul, uphaul, downhaul, furling systems and control lines. D2 Racing has a 12-strand Dyneema core coated with Marlow?s Armourcoat to improve adhesion between core and cover for good grip in clutches and jammers. Armourcoat also improves the abrasion resistance of the Dyneema core when the cover is stripped off to reduce weight. The smoother-profile 32-plait offers less friction and reduces wear through blocks. Liros Super Yacht DB is a new mooring line developed for super yachts from 70ft to 280ft. It is available in diameters from 24mm to 52mm with breaking strengths from 1150kg to 53,500kg. It has a coating system that gives it maximum abrasion resistance, high UV-resistance, excellent handling characteristics from its non-kink construction and stays soft and flexible. It has more than 20 per cent of stretch at 30 per cent breaking load.